"A great part of this job is learning about nature. It’s a big passion for me." 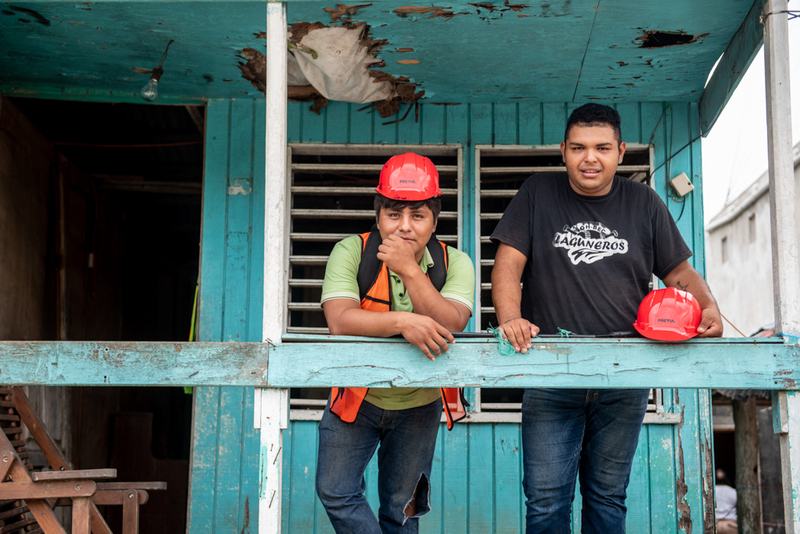 Luis and Osvaldo are part of the forest team working in the community-owned forest of Ejido Noh-Bec. Arriving early in the morning with a small group of forest workers, their job is to find and mark the trees for the logging team. Moving through the forest is hard work and though it’s still early in the day, Luis and Osvaldo already have sweaty clothes. They stop for a water break. It’s actually Luis’ first week identifying trees, so Osvaldo is in charge of his training. To Luis, the new job is exciting, but also challenging. “A great part of this job is learning about nature. It’s a big passion for me and something I would never get working in the city,” he says. “But the sun and the heat can be challenging, and the mosquitos are very aggressive at times,” he laughs, while holding up his arm with several bites on it. Using a small GPS unit they follow the coordinates of the FSC forest management plan to find the exact tree that is to be logged. They cut branches and place them on the ground to mark the way for the logging team. They then measure the tree to make sure it fits the requirements for logging, note it down and paint a number on the tree. Then they move on to find the next tree. To Osvaldo, who has been working with marking the trees for three years, the best part of the job is the freedom they have as a team. “As long as we do our job, we have a lot of freedom here to work and plan our own schedule,” he says. To the forest workers here, FSC has meant an extra focus on safety, like wearing the right safety equipment and being trained to work in the forest efficiently and safely. FSC has also meant extra income for the community, as the sawmill has attracted new business since it became FSC certified. The forest of Ejido Noh-Bec was the first community forest in the world to become FSC certified.